Customer requirements concerning shoes can be grouped into three main aspects: aesthetics, comfort and function. The aesthetic look of a shoe depends on the buyer’s preferences and it is not possible to establish an univocal aesthetic degree. Moreover the comfort of a shoe is a personal feeling of the customer. Some people can prefer a larger shoe whereas other want feel a strict contact between foot and shoe. The function of a shoe is depending on the customer’s use of the shoe, for example walking all day, driving most of the time, being seated at a desk and so on. 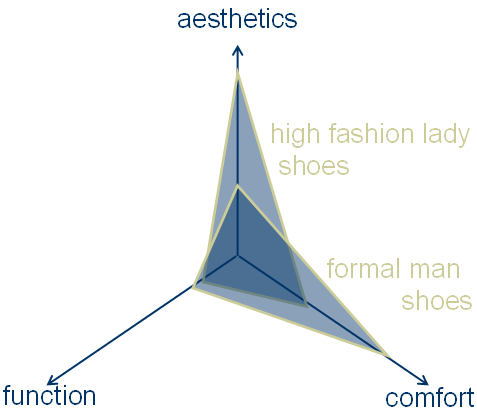 The correlation of the three main aspects of the shoe may be visualized in a three branches radar graph. Each axis is graded with one of the before mentioned class of perceived feeling of shoe features, called aspect. The first axis Aesthetics represents how the shoe looks attractive; the second Comfort indicates how the shoe fits and how the customer feet lie in the shoe. The last axis Function represents the features needed for the specific purpose of that kind of shoe. In the presented graph below two examples are plotted. The first refers to a high fashion lady shoe where the requirements are very high on aesthetics but very low on comfort and where no specific functions are demanded. The second example refers to a formal man shoe with a high level of comfort but only with standard aesthetics requested.